Most South Africans are familiar with isiShweshwe, but how many know the rich history of this cloth. 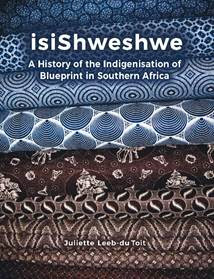 Woza-Moya in Hillcrest recently hosted South African author, Juliette Leeb-du Toit, who spoke on her recently published book, isiShweshwe: A History of the Indigenization of Blueprint in South Africa. In this beautifully illustrated book Leeb-du Toit traces the origins of the cloth, its early usage and cultural adaptations, and its emerging regional, cultural and aesthetic significance. In examining its usage and current national significance, she highlights some of the salient features associated with histories of indigenization. An art historian who has a particular interest in African and South African art, Leeb-du Toit has also had a lifelong interest in design and textiles. She is currently engaged in the recovery of modernisms in design history, the impact of German modernism in South Africa and the impact of China on the arts in South Africa.